KGB's Coe Lewis asked for my help on this one. Coe has friends with two cats they love but due to circumstances detailed below, they must find a good home for. My brother, Peter, is a long-time fan of yours and recommended that I contact you to see if you might be able to give us a hand through your awesome network of fans. Here is our story (I will do my best to keep it brief!). Over the last two years, our 3 year old son - Jack - has been battling chronic ear and sinus infections. And when I say "battling", I mean chronic, back to back, with no more than 10 to 14 days of reprieve before the next infection sets in again. From birth, Jack has been congested, stuffed up, etc. He was hospitalized for 10 days after he was born due to a lung infection. While he came out healthy and strong, it seemed that the congestion was constant but rarely did it slow him down. When Jack turned one he was diagnosed with his first ear infection. After multiple rounds of antibiotics, the infection persisted and the fluid remained in his ears. We visited an ENT every 4 to 6 weeks and were advised to get tubes to help alleviate the discomfort and the issue of the repeat ear infections. Jack had tubes placed in his ears and within two weeks after the procedure - the infections were back. Two months later, the infections were so severe and so frequent that he went back in to the operating room to have a second set of tubes placed in his ears and his adenoids removed in hopes that this would resolve the issue. Again, within weeks of the procedure, the infections were back. Over the course of this year, Jack has had 3 procedures, extensive lab work to rule out Cystic Fibrosis, every allergy imaginable and immune deficiency issues. Thankfully, all of Jack's blood work has come back negative and we don't believe we're looking at something scary but we still don't have an answer to what is causing the problem. And we are doing everything ... dairy and gluten free diets, ENT visits every 4 to 6 weeks, seeing an integrative pediatrician on a weekly basis. At this stage, we are in a place where we need to eliminate any potential triggers that might be the underlying cause and one of those potential triggers may be our cats - Thomas and Clarabelle. From the outset, we asked if the cats were an issue and we were advised to hold off on finding a home until we got to the bottom of some of the testing and to see what the outcome of the procedures would be. After 3 procedures, cultures, biopsies, etc., it's finally time to find a new home for our cats to give Jack a chance to get to a healthy place, should the cats be an underlying trigger. We have gone out to all our family and friends, put up messages on Facebook and trying so hard to avoid the shelter. 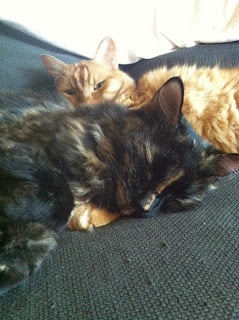 I adopted Thomas and Clarabelle 10 years ago while I was in law school and they are wonderful, loving and loyal pets. This is much more long winded than I intended but I am so hopeful that you might be able to help us. My husband is a helicopter pilot in the Navy and has been deployed or on work-ups for the majority of this past 3 years. We also have a beautiful little girl who just celebrated her 1st birthday. I was a full-time working mom until this past August when I had to quit my job due to Jack being sick nearly every other week. It's been a long road and I tried to hang on to keep the cats with us but know that a new home is the only answer. I know that there are people and families out there that would be take in loving, healthy animals ... I just can't reach them! I'm desperate for any help that you may be able to offer. A picture is attached of the cats - Thomas is the orange Tabby and Clarabelle is the Tortie. Both are 10 years old and such sweethearts. Thank you so much, Coe. I'm sure you get hundreds of emails and I don't even know if you'll get a chance to read this. If you do, thank you for taking the time. If you are interested, please contact Coe or myself.